Neighborhood Medical Center will be hosting our monthly Healthy Happy Hour at the Richardson-Lewis Center (872 W. Orange Ave. Tallahassee, FL 32310). This event will take place on Thursday February 21, 2019 from 5:30pm-7:00pm. This month, our focus will be on home buying and credit repair. 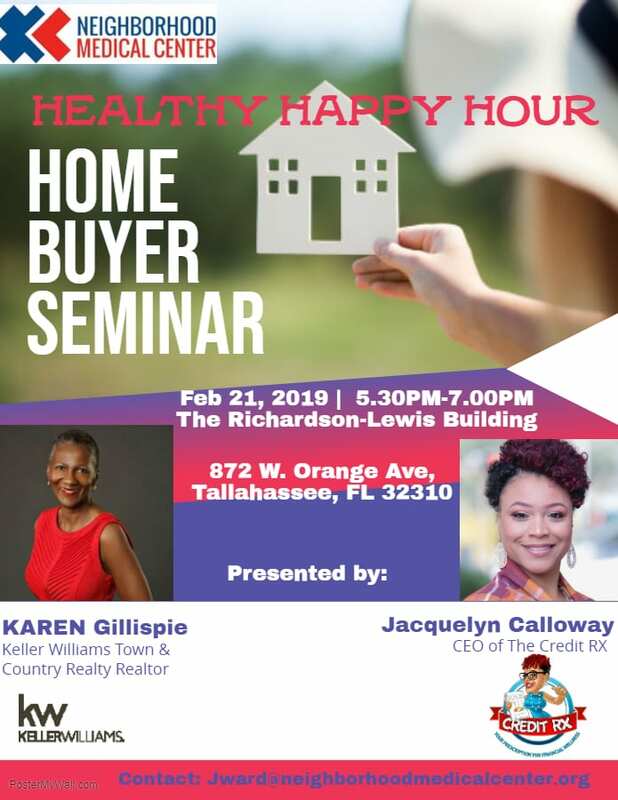 We have invited Karen Gillispie of Keller Williams Town & Country Realty Realtor and Jacquelyn Calloway the CEO of The Credit RX as our guest speakers. Please come out and help Neighborhood Medical Center spread the word to patients, family, friends, and community members as we learn empower ourselves and our community.